The Grand Prix of Latvia will live long in the memory for Rockstar Energy Suzuki Europe’s Glenn Coldenhoff who blitzed his rivals to take first and second positions in the motos and grasp his first victory in the premier class at Kegums today. The ‘#259’ posted Suzuki’s first win of the season in MXGP on his RM-Z450 in what is his maiden term in the category and also the first for his country this decade as Rockstar Energy Suzuki World MXGP’s Kevin Strijbos flew to fourth position as 23,000 spectators braved the showery changing skies that clouded and a bumpy, sandy track. Coldenhoff started the weekend well with a promising run to fifth place in Saturday’s Qualification Heat. The Dutchman was feeling fast and confident on the sandy earth and it showed from the first seconds of the first moto when he seized the holeshot and established a strong lead in the opening laps. With Strijbos quickly slotting into second position the two RM-Z450s fronted the world for the entire 30-minute and two-lap distance. The Belgian actually began to catch and apply some light pressure to his friend and brand-mate but Coldenhoff didn't make any mistakes and held firm for Suzuki’s third chequered flag of the year. After planting a small milestone, Coldenhoff was not to be denied at the start of the second moto. Again he vied for the holeshot and although he could do nothing about the challenge of current series leader Romain Febvre on the first lap he again embarked on a faultless ride that dealt with the presence of World Champion Tony Cairoli and Gautier Paulin. A 1-2 scorecard confirmed his triumph by seven points over the latter. Strijbos didn’t get around the first corner in the front-running sect and had to work hard to pass Shaun Simpson, amongst others, and arrive from ninth to sixth. The 29 year old then had too much of a gap to close to Evgeny Bobryshev. After three podium finishes in the last four events, Strijbos has pulled-up to 11th in the MXGP standings and lies just 19 points away from further promotion. Coldenhoff is now ninth and needs 17 to capture eighth spot. Clement Desalle continues to sit on the sidelines with a damaged medial cruciate ligament in his left knee but the Belgian is expected to start riding in the coming days and is optimistic of being in good shape to be able to return for round 13 of the 2015 schedule. Rockstar Energy Suzuki World MXGP will now look towards its next MXGP appointment in two weeks’ time when Loket will entertain the Grand Prix of the Czech Republic and one of the oldest and most-established meetings on the calendar. MXGP Moto1: 1. Glenn Coldenhoff (NED, Rockstar Energy Suzuki), 34:26.145; 2. Kevin Strijbos (BEL, Rockstar Energy Suzuki), +0:05.257; 3. Gautier Paulin (FRA, Honda), +0:45.698; 4. Antonio Cairoli (ITA, KTM), +1:00.847; 5. Jeremy Van Horebeek (BEL, Yamaha), +1:08.496; 6. Steven Frossard (FRA, Kawasaki), +1:12.170; 7. Jose Butron (ESP, KTM), +1:18.466; 8. Romain Febvre (FRA, Yamaha), +1:19.095; 9. Filip Bengtsson (SWE, Honda), +1:24.412; 10. Dean Ferris (AUS, Husqvarna), +1:27.896. MXGP Moto2: 1. Romain Febvre (FRA, Yamaha), 35:49.255; 2. Glenn Coldenhoff (NED, Rockstar Energy Suzuki), +0:02.389; 3. Gautier Paulin (FRA, Honda), +0:03.218; 4. Antonio Cairoli (ITA, KTM), +0:24.352; 5. Evgeny Bobryshev (RUS, Honda), +0:31.334; 6. Kevin Strijbos (BEL, Rockstar Energy Suzuki), +0:42.152; 7. Shaun Simpson (GBR, KTM), +0:44.601; 8. Steven Frossard (FRA, Kawasaki), +0:46.418; 9. Jeremy Van Horebeek (BEL, Yamaha), +0:48.018; 10. Todd Waters (AUS, Husqvarna), +0:49.190. MXGP Overall result: 1. Glenn Coldenhoff (NED, Rockstar Energy Suzuki), 47 points; 2. Gautier Paulin (FRA, HON), 40 p.; 3. Romain Febvre (FRA, YAM), 38 p.; 4. 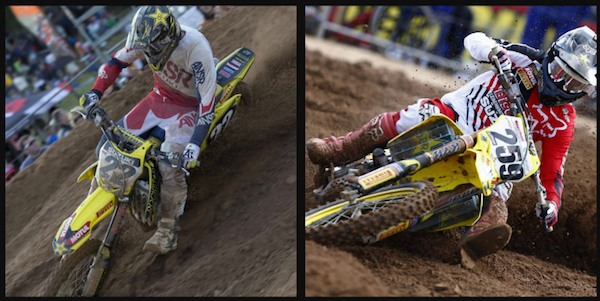 Kevin Strijbos (BEL, Rockstar Energy Suzuki), 37 p.; 5. Antonio Cairoli (ITA, KTM), 36 p.; 6. Steven Frossard (FRA, KAW), 28 p.; 7. Jeremy Van Horebeek (BEL, YAM), 28 p.; 8. Evgeny Bobryshev (RUS, HON), 26 p.; 9. Filip Bengtsson (SWE, HON), 22 p.; 10. Dean Ferris (AUS, HUS), 20 p.
MXGP FIM World Championship Standings (after 12 of 18 rounds): 1. Romain Febvre (FRA, YAM), 457 points; 2. Antonio Cairoli (ITA, KTM), 416 p.; 3. Gautier Paulin (FRA, HON), 391 p.; 4. Maximilian Nagl (GER, HUS), 360 p.; 5. Evgeny Bobryshev (RUS, HON), 345 p.; 6. Clement Desalle (BEL, Rockstar Energy Suzuki), 291 p.; 7. Shaun Simpson (GBR, KTM), 276 p.; 8. Jeremy Van Horebeek (BEL, YAM), 260 p.; 9. Glenn Coldenhoff (NED, Rockstar Energy Suzuki), 243 p.; 10. Todd Waters (AUS, HUS), 242 p.; 11. Kevin Strijbos (BEL, Rockstar Energy Suzuki), 223 p.